Rooms, services Discover the beauties of Czech Republic and check out the opportunities provided by Hotel Relax Inn Prague! Guests looking for accommodation in Prague are welcome to book 40 nicely furnished rooms at the hotel. If you feel like having a meal not included in your chosen type of catering, you can always taste local dishes in the restaurant of the hotel. If necessary, you may leave your car at the parking place of the hotel. Airport transfer is provided upon preliminary notice. You may secure your valuables in the safe. In case you'd bring your laptop along, you may go online via free wireless Internet connection (WiFi) available in the rooms. If you wish to learn more about the exact scope of services provided by Hotel Relax Inn Prague (including those available for an extra fee) or about the equipment of the rooms, you can find the complete list on the information sheet below. RevNGo.com rating The hotel has achieved 8.2 score and thereby "Good" classification on RevNGo.com, based on one review. 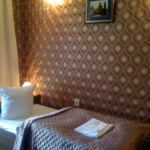 The rating of Hotel Relax Inn Prague is 8.2 from the maximum 10, 1 based on actual and valid guest ratings and reviews.